Power Point in Spanish/English and informational VIDEO. President Obama announced on November 20th several changes to US immigration policy including to expand the Deferred Action program for Childhood Arrivals (DACA) as well as provide relief to parents of US citizen and lawful permanent resident children (DAPA). 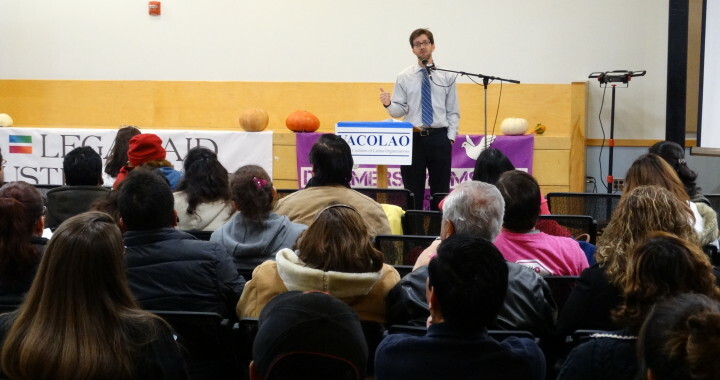 On December 4th, the Legal Aid Justice Center provided an information session on the new polices that included details on eligibility requirements, how and when to apply, and other related issues such as eligibility for work permits, authorization to travel outside the United States, and eligibility for Virginia drivers licenses.Legal Aid Justice Center put together these materials. This presentation is intended to provide general legal information and is not a substitute for legal advice. Each case is different, and you should consult a qualified immigration attorney if you have questions about your own case. Notarios publicos are not attorneys and are not qualified to give you legal advice. This information is accurate as of December 4, 2014. Este material educativo esta actualizada al 4 de diciembre del 2014. Esa presentación tiene por objetivo proveer información legal general, y no sustituye consejo legal individualizado. Cada caso es diferente, y usted debe consultar con un abogado de inmigración calificado si tiene preguntas sobre su propio caso. Los “notarios públicos” NO son abogados y no son calificados para darle consejo legal. Alivio Migratorio – Lo que Necesita Saber from Virginia Coalition Latino on Vimeo. Posted in Administrative Relief and tagged DACA, DAPA, Edgar Aranda-Yanoc, Legal Aid Justice Center, Simon Sandoval Moshenberg, VACOLAO.